Jason Alexander: Thanks a lot for agreeing to chat with me a little bit. Art [Spiegelman] was obviously a well-known figure in the GPK scene and Art was adamant that we also needed to talk to you and I'm very grateful to him for putting us in touch so again, thanks a lot. Len Brown: I'm sorry, I seem so hard to track down. I read a note, I guess it was from GPK World or somewhere I read a note that I was very tough to track down. I'm not in hiding so there's a bunch of people ... Did you ever talk to Ira Freedman in Topps? JA: No, there's several people I need to talk to, Ira Freedman would be one. Also I want to try to track down Arthur Shorin, I'm assuming he's still alive. LB: He is, he is. I'm not sure he gives interviews, but you could certainly try. I know he has an office in Manhattan, but I've lost touch with him lately. I did continue to consult for Topps for a good number of years after I retired in 2000. JA: I've got to ask you, being from Texas myself and you're right in my neighborhood, how was it living down there with a New York accent? LB: Oh, I get kidded about it all the time. You may or may not know, I host a classic country radio show on a local station here and it seems incongruous with my accent to be talking about Ernest and Hank Williams and Patrick Klein. I'm happy to be able to do it down here. When I moved down here my days on the radio were over with this accent, but there's a community radio station that welcomed me and I'm happy to be there for a good number of years. JA: I didn't want to take too much of your time, but hopefully we can just march through a few questions if you can manage to stay with me for 15, 20, 30 minutes or what have you. LB: Oh absolutely, absolutely, I'll be happy to. The only problem, I'll be 75 in a couple of months so you know the grey matter and the memory sometimes doesn't pull up as quick as I like but I'll do my best. JA: At least you had it, I'm 41 and I'm not sure I ever had a fully functional brain. It's okay, it's okay you'll probably still outpace me so we'll be okay. My first question is really background. You kind of already started introducing yourself in terms of what you do, the country music station, but can you tell us little bit about what you're currently up to these days? LB: I retired in 2000 and moved down here, I worked for Topps for 40 years. I started when I was 18 years old and ... What do I do these days? Take more naps than I frequently did. I'm still in touch with Jeff [Zapata], we email a lot and Jeff of course came down here, I was delighted when he came down here with the crew that were doing the documentary. I guess you've seen the documentary at this point? JA: I did, yeah. It's great. LB: Yeah, they did a real nice job. JA: What about this radio country music station you're doing now? Can you tell me a little bit about this country music station? LB: Oh, it's not even a country music ... It's community radio (www.koop.org), it's very eclectic and they have so many different shows. It's fun because unlike corporate radio I don't have to follow a program director's playlist, I bring in stuff from my own collection. I have a very big collection of old time country music, from Bob Wills up to the 80's I guess. It's fun to do, because we don't beg people to call in with requests but if we get one we can usually satisfy it and put it right on. JA: Let's go on to the second question here. You started really young, your career trajectory is a lot different from a lot of the other artists and art directors and whatnot. Most were in for 10 years or so, worked on Garbage Pail Kids and a few other projects and were out, but that was the bulk of your working career. Did you have schooling or background in something in particular, or personal connections? What brought you to Topps when you were 18? LB: What brought me to Topps? A wonderful gentleman who is like a father to me who worked at Topps at the time and his name was Woody Gelman. He wasn't around when Garbage Pail Kids happened, he was a round for a lot of important stuff including Wacky Packages, Mars Attacks, stuff we worked on together in the '60s. I met him on a fluke, believe it or not. I'll keep it fairly brief. I was riding on a bus one day, and in those days there were newsstands in Brooklyn and magazines hung by clothespins on newsstands, believe it or not. I saw a magazine that said Davy Crockett for Boys and it was hanging on the front of this newsstand. It wasn't that far from my house, the next day I walked back about a mile to the newsstand, bought this magazine because Davy Crockett was very popular at this point. This was 55, 56 era. Bought the magazine, wrote a letter to the editor because I thought it was a great magazine and they were doing a series of books for boys; all of Woody's books were published under the title of Triple Nickel Books, because they sold for a bargain price of just 15 cents. There was a very successful boys fiction series that had been around for years called the Hardy Boys, which is probably still around. The series Woody published back in the 1950s was a knock-off of a popular Grosset & Dunlop book series that has been published for decades and Woody's books were called The Power Boys. I think it was a good read, it also about two teenage boy detectives solving mysteries; I believe 4 or 5 different issues were published and I bought 'em all. Anyway, I wrote this letter and unexpectedly I got a phone call from the publisher. He liked my letter and he kind of wanted to pick my brain for other ideas that might be interesting to kids, boys in general. He was working full-time at that point with Topps and invited me over to the Topps office. I think at that point I was 15 years old. Woody and I became close, he always said stay in touch. I visited Topps a number of times before I was 18 and then as I was approaching my 18th birthday he offered me a part-time job at Topps, I was going to school for the other part of the day. Started at Topps when I was right about 18, stayed there and didn't leave. I certainly enjoyed the work because I was a collector, I collected trading cards as a kid and I remember buying Hopalong Cassidy cards in the early 50's and a whole bunch of different things that Topps put out back then, never dreaming back then that I'd spent 40 years of my life, my working career at the Topps company. It was called Topps Chewing Gum in those days. JA: It started as a confectionery company didn't it? JA: Once you were at Topps ... I guess now we're going to around 18 years old and little bit older, can you kind of walk through what those roles and responsibilities were and how they changed? LB: I was always connected to what they call the New Product Development department. It's just like we call Garbage Pail Kids, GPK, they used to call it NPD, kind of funny. I remember one of the first things I did when I started working there at 18. We were in charge of almost any editorial product that came out, whether it was sports in those days or something they would call non-sports cards, or Bazooka, Bazooka bubble gum, that had little comics in it. I remember one of the early assignments that Woody gave me was we needed more jokes because we like to keep these little Bazooka Joe comics fresh. Every 6 months we'd do another batch and remove some of the older ones we'd use. If a kid was buying it regularly it somewhat assured he didn't get a duplicate and he'd get a fresh little Bazooka Joe comic strip with the bubble gum. That's how I kind of started. I was answering mail for Woody and at the time it was a smaller company, he didn't have a secretary. I started more as a secretarial assistant to Woody and really enjoyed it. We would always talk about cards that we thought would work for Topps as a successful series. I remember when I started there they had just put out Jack Davis work. He did work for MAD magazine, MAD comics back then. One of the things that Woody and I liked to do was find artists that would feel ... I would say that Topps could actually use. We were trying favorite artists that we liked in the comic book world. I was a big EC Comics collector in the 50's and big fan of Wally Wood, Al Williamson, George Evans worked for us for quite a while, he was also a popular EC Comics artist. The pleasure of working at Topps was that Woody and I had interest in all the things Topps was doing. It was in a way like a dream job. I remember when I was in school, Sunday night came and I'd get depressed because the next day meant school. Once I was done with school I was going to college in the evening, on Sunday night I was ecstatic. The next day I can get back to the office, be with Woody and work at Topps again so it was really like a dream job. Art Spiegelman was another fellow and I know to. Art was another guy who was a fan of Topps material, and Woody found him ... wrote a letter to Topps just like I did. I think he was about 16 years old and we started to bring him in and give him little assignments because he had a great, fertile mind, very funny guy, creative and a great artist. Have you seen his book Maus? M-A-U-S.
JA: Oh yeah, absolutely. The Pulitzer Prize winning comic. LB: It's brilliant. I remember him working on it page by page. He wanted to do it as a tribute to his parents and get it out of his system, he never thought it would materialize into a best-seller and as you say an award winner. He kind of laughed when I told him this is going to make some impact when it comes out, it's brilliant. He would laugh and say nah, only a few people will ever care about it, showing the Nazis as cats and the Jews as mice. JA: Yeah, absolutely, very powerful stuff! What were the rules and responsibilities like in the 80's time frame? LB: I was always involved in the various art sticker products that Topps would put out, but we were pretty busy doing other things for the company too, we were attending marketing meetings. A lot of times I wasn't even present, although the fellows always wanted me when the discussion came to Garbage Pail Kids because I enjoyed still keeping my hand in the creative process. Even though part of my job was now dealing with corporate matters, we were still expected to turn out a lot of different cards and sticker products during the 80's, just as we had in the 60's and 70's. I was there for a lot of that, and then a lot of times Mark [Newgarden] and Art Spiegelman would meet together and they'd call me when they really needed me because I was in a marketing meeting that Arthur Shorin wanted me to be attending. There was a point when Topps felt, when we were doing baseball cards, this is going back to the early 60's now. When they would be shipping, manufacturing baseball cards for the new season, they didn't want to think about doing any other set of cards because they had this fear it would interfere with the sales of baseball cards which was our number one product in the early days of Topps. There wasn't that much of a demand "Hey, we've got to get other material out, other card sets out". Rather quickly they kind of found out you could be selling baseball cards and you could be selling Wacky Packages at the same time. There's a lot of space on that candy counter and kids are always looking for something new -- the things that storekeepers loved about Topps. I would visit a lot of stores and try to get a feeling for what kids were interested in by talking to kids after school in some of these candy stores back in those days, in Brooklyn ... get a feeling for what they might be interested in, what TV shows and down the line eventually movies. Didn't start out we were doing a lot of movies, but then of course Star Wars came along and blew all the sales away. We also kept an eye on the entertainment field, singers were real popular. Even before I came to Topps, there was a big success for Topps with Elvis Presley cards about 1956 or 57. One of the bigger sets we ever had, most successful, was Michael Jackson. JA: It was interesting that Mark Newgarden brought up in his interview how Major League Baseball did not like Garbage Pail Kids. He thought maybe they were hooked in with evangelical preachers or whatever and Topps smiled at them and said "Oh yeah, Garbage Pail Kids? We don't do those anymore", but they keep doing that year after year after year, kept doing Garbage Pail Kids while they were telling Major League Baseball that they were no longer doing it. I thought that was pretty humorous. LB: Yeah... I don't know if his name came up, he was our vice-president of sports and one of his jobs was to go into the dugout and give the ball players Bazooka bubble gum and sign the new players who were in the majors for the first time because we had to sign an individual contract with every player to get the rights to use their picture in our baseball series. This was true with football, hockey and basketball for a certain time, but he said he was having a lot of trouble particularly down in Texas with either the Houston Astros or the Texas Rangers back then and they, the players ... this happened by-the-way, even before Garbage Pail Kids came out -- we would sort of do edgy humor projects Wacky Packages ... they didn't like Wacky Packages either. LB: Wacky Packages truly was, it came out for the first time in the 60's and it was a trading card actually. We hadn't really discovered the power of stickers at that point and we put it out as a card back with glue. There was dry glue on the back of the trading card of the very first wacky package. The kid had to wet the back, lick it, probably sounds pretty disgusting about licking cardboard, but that became very big. It was sort of a one-time product. We had never come up with the concept, you can do a series two of these things. It seems so obvious now because we've done so many series, but anyway I'm answering your question long winded-ly. Wacky Packages was very very successful the way Garbage Pail Kids was and we ultimately did 15 or 16 different series of Wacky Packages, that was red hot. That was another one that made tremendous impact and it took a while to get another one like that but those would be number 1 and 2. I don't know which one ended up selling more, I would guess Garbage Pail Kids because at that point we were in all the Walmart-type stores and K-Mart and stores that in the 60's probably wouldn't have taken our novelty products. They might have carried baseball, they didn't carry our offbeat material... certainly not Mars Attacks ... which has a great collector's following today, but it wasn't huge success when we first put it out back in the 60's. JA: Right, absolutely. That's interesting, it was the individual player level that there was a little bit of discomfort signing with Topps then, huh? JA: Yeah, absolutely true, right on. At Topps over your 40 years, are there any kinds of projects that stick out in your mind that you can really identify as the most pleasurable to work with or ones that maybe you were a fan of yourself? 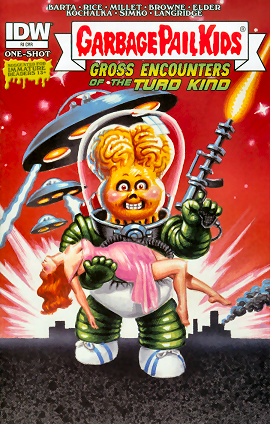 LB: I absolutely love Mars Attacks. Woody and I conceived the idea ... Woody remembered when he was a boy there were these Horrors of War cards that came out back in the 30's and they were really popular but they were really gross. He always felt that maybe Topps would do something like that if the right property came along and it did in Civil War. In the early 60's it was the big Civil War anniversary, I forget exactly what the anniversary was of it, but it was probably 100 years after the Civil War, something like that. The president of our company wanted us to do a Civil War set and at the time our first inclination was kids don't care about history, they're not going to buy trading cards about history these days. Horror comics are selling on the newsstands, and TV has all this violence. Then Woody came up with the concept, we can make Civil War violent the way Horrors of War was so popular back in the 30's and that's what we did. They were pretty violent, a lot of bloodshed and swords going into people, blah blah blah. That became in a way a genre that we would go back to cap a few times and that did well, the Civil War cards. About a year later we came up with Mars Attacks thinking we could do a space invasion, science fiction movies were catching on in a big way in the 50's and 60's. This was about '61 or '62 and Woody and I worked on the Mars Attacks cards. I wrote the backs for them and we planned every picture ... Woody was an animated artist who worked for Paramount Studios before he came to Topps and in fact worked on Popeye cartoons for the Fleischer Studios back in the 30's and 40's, before he came to Topps. He was a good artist and he'd sketch out these little rough ideas of what we would conceive would make good picture cards. Each one was planned individually and I loved working on that, I was a big science fiction fan. I used to buy Amazing Stories magazine and read it from cover to cover. I love the old Pulps, the Pulp magazines that did a lot of these science fiction things so it was right up my alley, that was a real pleasurable things. 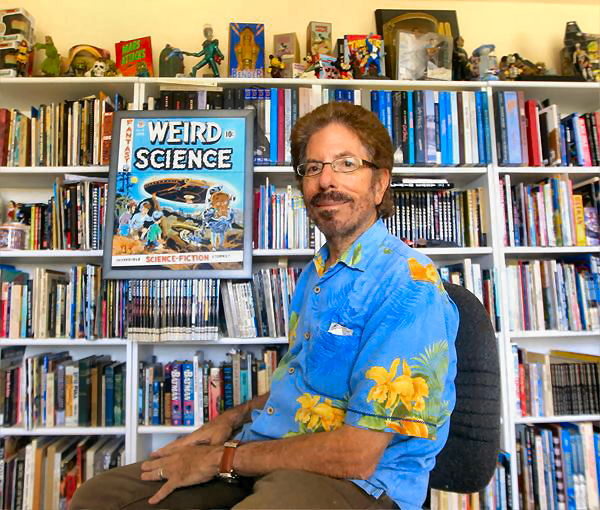 Wacky Packages was a lot of fun and I was involved in that a lot from the early days; Art Spiegelman was a big influence, came up with a lot of the gags and concepts on that. JA: What are some of those big artists that you recall working on the Civil War stuff and the Mars Attack stuff? There's really some beautiful, beautiful art, I mean really wonderful stuff. 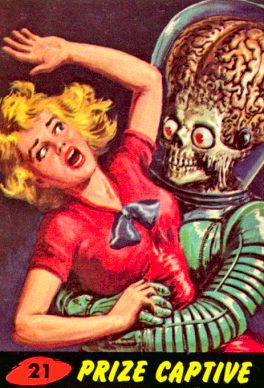 LB: Oh yeah, well the top artist that we found was Norm Saunders who did a lot of the Mars Attacks cards. I think we found him around the time of Civil War and he came in late because the first artist was having trouble meeting our deadlines and we needed to get him some help so we could get the series done and ship it to the marketplace while the centennial of Civil War was still going on. Norm Saunders was an amazing artist who did a lot of Pulp magazine covers. From all different genres, Westerns and crimes. The Pulps were like the precursor of paperbacks. We were lucky to have found him, he was great. JA: It's really some splendid stuff. I wish I could find some of those original artworks that were for sale, but I'm afraid maybe it would break the bank I'm sure. LB: I'm certain. Years ago I heard a wrapper went for something like $1,000 dollars, a wrapper. Wrappers were never saved, kids even though every time they bought a pack they got the wrapper, they'd crumble it up and toss it away. Thankfully some kids saved the cards and kept them in nice condition. JA: For the original painting, yeah. 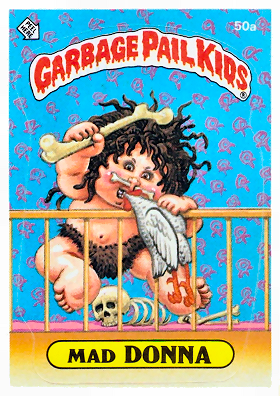 Going into the GPK era, what were your first memories of that? The dynamics in the office of Topps, what was going on? 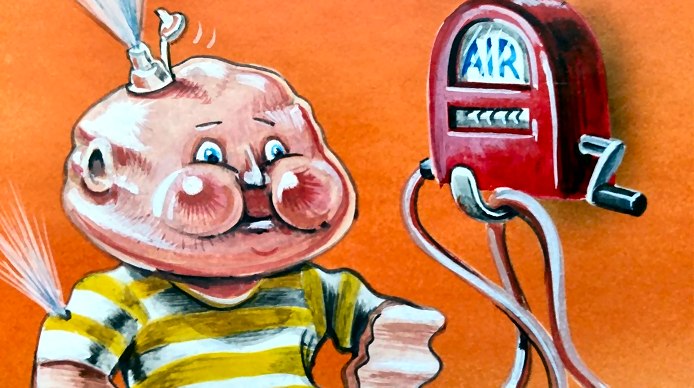 LB: It's probably covered pretty well, even more than I can bring to this conversation by the various interviews that Jeff and the filmmakers did for the GPK, they pretty much went into a lot of detail. I remember when I got a copy of the video and they ran it, it brought back memories of things I'd forgotten. The movie was almost like a non-event for the people at Topps. We chuckled when we heard, a movie of this? It's hard to believe but ... It wasn't much of a success. LB: Oh god, I guess we should all feel, the Topps people should feel honored. JA: Absolutely, that is a huge victory. LB: Yeah, we had no input whatsoever with it and didn't know what was happening. I'd someday like to see the cartoon that CBS planned to put on but I remember they got cold feet at the last minute... Did one episode run or did they never ... ? JA: Oh no, I don't think it got aired at all. LB: Yeah, they probably had to get the work done before September 1st came around and new fall season shows were coming up. They probably got at least ready to show it. JA: Yeah, it's interesting. So pretty much what you're saying is no distinct memories of that particular period, most of it's all covered with the documentary and other interviews we've done, like with Spiegelman and Newgarden and those folks? LB: At first we didn't know ... Now it seems so obvious looking back you think like "Wow, you just do funny looking dolls that look kind of like Cabbage Patch Dolls and you put them in a gross situation and funny name that works with it". It seems so obvious, but when you hear the fellows talk about it, it brings back some memories and you realize how much we had to deal with to move it forward. We didn't have the obvious answer of what we were doing when we started. Of course you know the story, we tried to get the rights from the Cabbage Patch people and do a set of Cabbage Patch dolls straight. They weren't that eager to sell it or they asked for a lot of upfront money or something. Arthur goes "Well we've made dough parodying things before, let's parody this." Step-by-step we had a lot of little rough sketches drawn. [John] Pound visualized it so well for us that we knew he was the right artist. At first he was trying to do them all, we were trying to have one artist work on the entire set but it was tough and we little by little pulled in more people. [James] Warhola and [Tom] Bunk and there were a bunch of really fine artists that helped make it successful. JA: That kind of brings me to a specific question that ... you know George Wright the artist, the illustrator... He worked on Wacky [Packages] later. He had sent Topps a letter with his Garbage Pail Kids samples at one pont ... I have the letter actually, and believe it or not and it's signed by you. It's basically telling George thanks a lot for the paintings, full finished paintings ... thanks for the paintings but we've got our cohort of artists and we're not looking for anybody at this time. Were artists really trying to solicit to get into the GPK world or what was that? Have you recalled any of that, how that happened? LB: You just mentioned a name that I don't even recall, George Wright. Is that W-r-i-g-h-t? JA: Yeah, George Wright. He actually worked on Garbage Pail Kids but the reboot, the newer stuff. He was trying to get into GPK in the mid 80's. LB: This is one of the cases where I just don't remember that particular incident. I didn't remember working with him. If you would ask me point blank, I probably would have said no, he didn't work on the series, but I would be wrong I guess because he did eventually. LB: Oh yeah, I didn't even realize that she actually did some final artwork until I guess I heard it. Usually the Art Department didn't work for NPD ... she was a talented lady by the way, very good artist. I had forgotten that she ultimately did a couple, I don't think she did a lot, maybe like 3-6 would be my guess. It was hard to borrow from the Art Department, she had a full time staff job at Topps and they didn't want to give her up to NPD. I guess as we expanded some of our writers ... A lot of the writers that would come in, Mark brought some of friends and Art recommended certainly a bunch of people too. Art knew the underground cartoonist community very well as did Mark and I think as the deadlines got shorter and shorter for us ... Hey, Series 7 is due in ... I don't know, I'll make up a number, in 2 months, we've got to get 44 paintings done real quick. We started to feel we needed more and more artists, try to pull them in. Art would recommend different people and Mark would recommend different people so they didn't necessarily come to us. I thought basically we were out there getting them but I'm sure there were people like George Wright who saw this phenomenon by the time the second or third series came out it was really all over the place and getting a big press about it. Probably it did attract some artists that would submit samples and hopefully we'd buy their work. I think more we would find ... I'm not sure we got a lot of people that sent in a note and a sample painting that we didn't solicit. I don't think that many came in by accident if you know what I'm saying. JA: Yeah, absolutely. I thought that was really interesting. The letter made me assume you were largely on the management end or at least dealing with a lot of the management functions. LB: Now, you're talking about the 80's where I wasn't that involved in every picture that was coming out of Topps. Back in the 60's Woody and I were very involved, Stan Hart and Art Spiegelman, we were 4 guys that dealt with editorial work and concepts, but as Topps got bigger and either we were looking for other types of bubble gum ... Bazooka used to be the number 1 bubble gum, I guess Topps is still putting out Bazooka somewhere, I'm not even sure how much they sell of it anymore. We got more and more involved in management problems and that pulled me away from being involved on every decision being made on an editorial card or a sticker. JA: Right, absolutely. Did you enjoy the management end of working on Garbage Pail Kids? LB: I did, I did as much as anything it was always fun to work with Art particularly -- we became close friends. JA: Do you recall any Garbage Pail Kids pieces you really really loved, but also what are the other pieces that you really loved at Topps that you worked on like for example the Mars Attacks ... any particular pieces? LB: I was involved in just about every Mars Attacks painting, first dealing with the artist that would do the pencil and then the penciler didn't do the painting, we actually had a 2 step process. Any of the Mars Attacks things were a great favorite. I particularly enjoyed another series called Battle which was a World War 2 series that came out a year after Mars Attacks, a year or two after. That was depicting the Nazis and typical World War 2, almost looked like the men's magazines that used to come out in the 60's depicting scenes of World War 2 on the cover, a lot of men's adventure magazines. It was fun to create these things out of your head, see it suddenly become a real 3 dimensional ... Well, 2 dimensional painting of a scenario that you kind of creating. 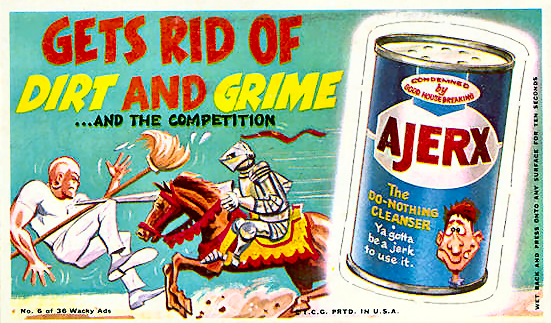 I love working on those, and I love working on Wacky Packages an awful lot. I was more involved in the editorial of Wacky Packages than I was in Garbage Pail Kids frankly. When the Garbage Pail Kids pictures would come in then we'd have a naming session and coming up with the names was kind of fun. I had 4 young kids at that time, in fact in the 80's my kids were pre-teens and I remember I think it was my daughter who came up with the name that was called "Mad Donna". M-A-D D-O-N-N-A. LB: Oh no. Jack Davis told me ... to be honest, Jack was a fairly religious fellow from down South, I guess out of the Bible Belt, came up from Georgia I think and was living in New York. He never liked the fact he was doing horror comics for EC. They had given him back his old artwork ... I don't know if it was his old artwork, I think it was the comic books that they sent him. I think back in those days the artists didn't get to keep the artwork that they would do for the comic book companies. Just in the way, back in those days, Topps didn't give the artwork to the artist that did Garbage Pail Kids, it became the company's property fairly, or unfairly, but unfortunately that was it ... Jack Davis told me they took all the EC comics that he had drawn and burnt them in their back yard. LB: Again not the artwork, the comic books. JA: Oh okay, not the art. LB: Oh yeah, that would have been a double catastrophe. I think most of those were stolen or sold, the way artwork tends to vanish around corporate companies over the years. He burnt his collection and that killed me when I heard that because I was a big EC fan. I loved the stuff and he said he burnt it all. When EC went out of business I would always hunt the used book stores and look for old copies of the old comics, I really loved those. When we worked on Star Wars, I went and met George Lucas in his office and got ... this is the Series 1 1977 ... pictures from their slide files and worked on the first Star Wars set a lot, I really enjoyed that. The day I was in George Lucas's office, Mark Hamill came in with his girlfriend to visit George Lucas and I was introduced to Mark Hamill who ... I was like oh my God, because I was a big Star Wars fan back then. All I wanted to do was talk about making the Star Wars movie and had a whole bunch of questions I wanted to ask Mark Hamill. He heard I worked for Topps and it turned out he was a Topps collector of Topps cards and he only wanted to talk about things I had done at Topps so it's kind of funny. JA: That's hilarious. Were you able to keep any mementos from your GPK days or Wacky Packages or any really treasured mementos that you kept? LB: I would keep the box ... At that time I would always buy a box of the cards .. there was always boxes of cards around, Series 1, Series 2, Series 3, God knows what happened to them over the years. One of the terrible things was moving from Brooklyn to New Jersey and then from New Jersey when I retired down to Texas and anything I had just disappeared... Can't even tell you what happened to those original boxes that I had. The things that I worked on I liked to keep samples of in my cluttered garage and I have a very understanding wife who allowed me to clutter my garage. There were two women that cost me a lot of money. One was my mother. I would complete a set of 1955 Topps baseball cards and have it in a cigar box neatly stored; when the new series came out the following year she would take it upon herself to throw out the old set. When I would kind of protest she would say well you're collecting the new series, what do you need that for? It's the new ones that you're collecting. I had to make room and I tossed it out. That was one woman that cost me a fortune. The second woman was my first wife who ... We went through a nasty divorce. I was out of the house and she was selling stuff to dealers so I lost a lot of my collection. The sports cards and the various trading cards, probably the early Wacky Packages went that way. These two women cost me a fortune. JA: Oh yeah, sounds like it. It's the collector's plight, I hear art collectors all the time saying they went through a divorce and now they're trying to get back their art that their wife sold, or even worse. 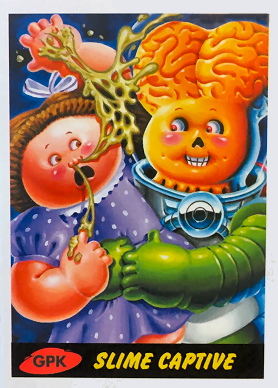 Sometimes there's a few Garbage Pail Kid artworks that actually got torn into bits, including my favorite Hippy Skippy. You hear of these things, it's very sad stuff. Okay yeah, Thank you Len, this has been very very educational and entertaining and thank you so much for your time. JA: No you did great, thank you so much. JA: Thanks Len, take care of yourself.